With London constantly striving to offer the very best in a myriad of event spaces, 2019 offers yet more innovative and interesting venues to explore for every type of event, from the large to small, the interactive to blank canvas. Here are a few of our favourites for the coming year. Although the Science Museum is already a firm favourite of ours, their new offering Illuminate, situated on Levels 4 & 5, offers panoramic views of the city as well as an urban, functional space for up to 400 for conferences flooded with natural daylight. Based in South Kensington, Illuminate is a welcome day time addition to the other event spaces featured in the Science Museum such Wonderlab, an interactive and entertaining exhibition and event space, perfect for evening receptions. You can combine the two for delegates, or simply isolate Illuminate for your event needs. With stunning minimalist interiors, it’s bound to be a hit for those looking to combine style and London views. Another pleasantly light, urban space, Camden House offers a minimalist, stylish space to host a plethora of meetings. With ample break out spaces, room to host a reception for 1000 or seat 450 for dinners, this space pays homage to the creative and vibrant energy of Camden Market and the surrounding North London borough. With exclusive features such as retractable roof and bi-folding doors, the venue allows delegates to absorb the culture and energy around infamous Camden. 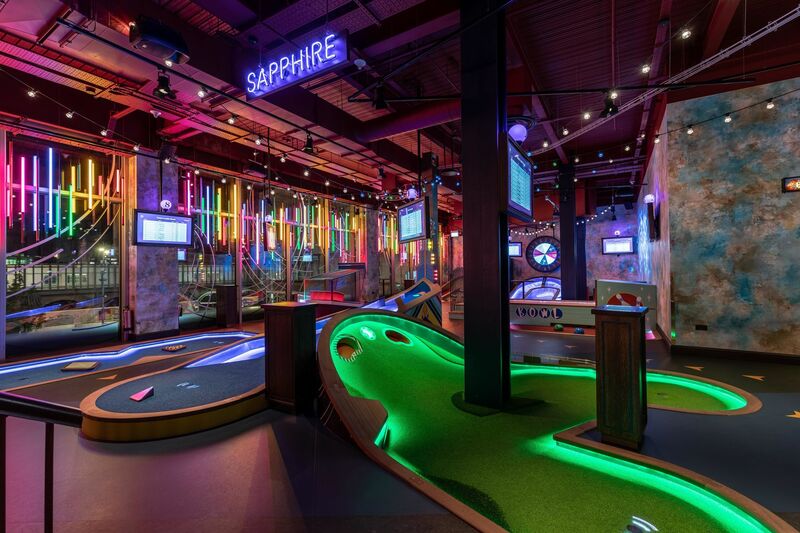 Following the success of it’s sister property in Stratford, Puttshack is opening the doors to a new venue in the City. Opposite the highly acclaimed Ned Hotel, this underground haven of golfing fun is a big kids playground. With striking interiors, high tech tracking technology to take the hassle out of scoring, this could be the ideal venue for an informal networking evening. Hire an area and embark upon a few rounds of mini golf fun, or take over the entire property for exclusive use. We can’t wait to go down and explore in March. If you like the look of any of these venues, or are interested in exploring more of what the city has to offer, don’t hesitate to get in touch and let’s see if we can help you to design your bespoke London event in 2019 and beyond.